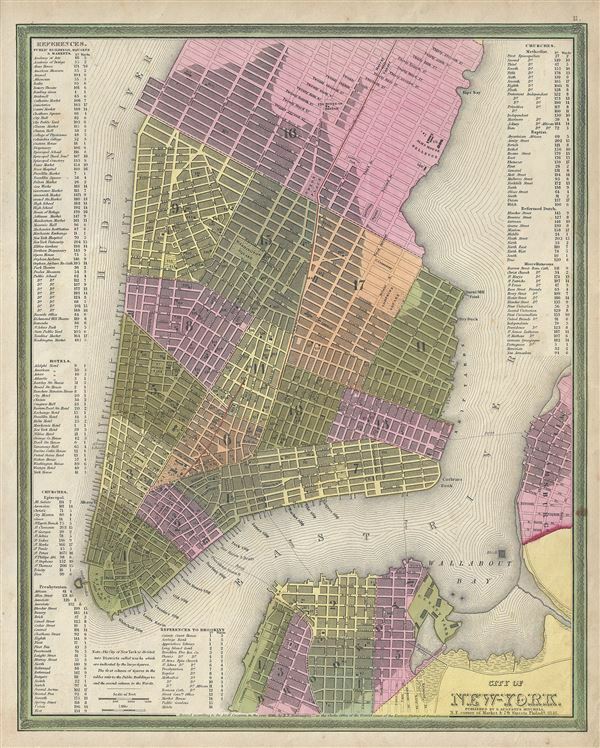 This is a beautiful example of S. A. Mitchell Junior's 1846 map of New York City. The map depicts southern Manhattan from 37th street (Kips Bay) south to Battery Park and Brooklyn from Williamsburg to Columbia St. Mitchell offers wonderful detail at the street level including references to parks, individual streets, piers, ferries, and important buildings. Color coded with red, green, and yellow pastels according to political divisions. The whole is engraved and colored in Mitchell's distinctive style with green border work and vivid pastels. One of the more attractive atlas maps of New York to appear in the mid-19th century. This map was prepared by S. A. Mitchell for publication as plate no. 11 in the 1846 edition of MitchellÂ's New General Atlas. Rumsey 0537.012. Phillips (Atlases) 6103-11.